There is a good reason why the 2018 Hyundai Elantra was awarded the Top Safety Pick for 2018 by IIHS. 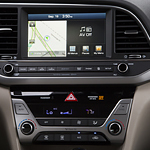 Hyundai packed this sedan with a ton of safety features to prevent collisions in crowded parking lots and on long stretches of highways. That is why so many parents find that the Hyundai Elantra is a perfect car for less-experienced teen drivers. Driving at night does not have to be as perilous in the 2018 Hyundai Elantra. This sedan comes with dynamic bending lights that move as you turn the steering wheel. This gives you better visibility around turns at night. The high beam assist feature will dim your lights automatically when other cars are approaching so that everyone in your zone on the road can stay safe. Test out all of these amazing safety features on the Hyundai Elantra at Korum Hyundai to see why everyone is so impressed.